Exhibition as part of the 30th Mercat de Música Viva de Vic. 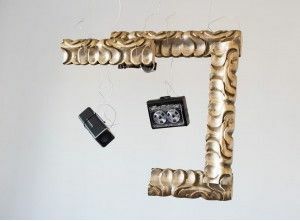 An acoustic assemblage in a golden frame that cyclically reproduces a double synchronised soundtrack composed of altered original pieces by Bob Dylan, Chuck Berry, Elvis Presley, James Brown, Jimmy Hendrix, Little Richard, Stevie Wonder, The Beach Boys and The Who with a muted magnetic tape reader and a wristwatch. ECHO, in Spanish, from “echarse al monte, echarse al suelo, echar por la borda” and, in English, from ECHO as an acoustic delay. Born into a family of jazz musicians. Chose a career in contemporary art, breaking with family tradition. Contemporary of Jordi Benito and Manel Clot, born and living in Granollers. Situates his work between artistry and disaster.